When the temperature comes down, I tend to crave for comfort food which is quick to make yet super tasty. And its also important that I include nutrient-rich vegetables to make it healthy. Its been pouring cats and dogs the past few days with no sign of any sunshine. 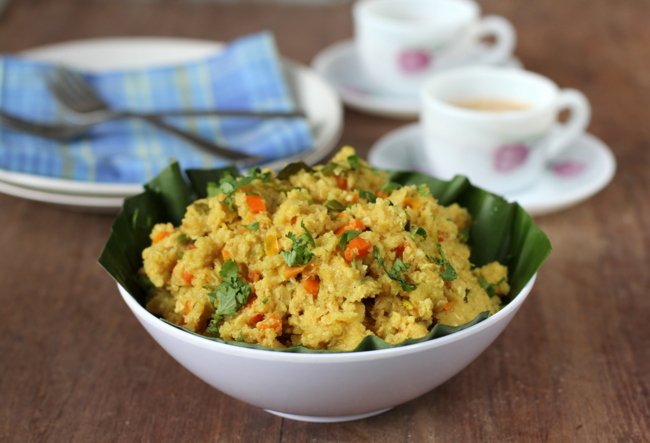 On one such cold and rainy morning, I prepared Oats Masala which is close to Oats Upma recipe that I blogged earlier. 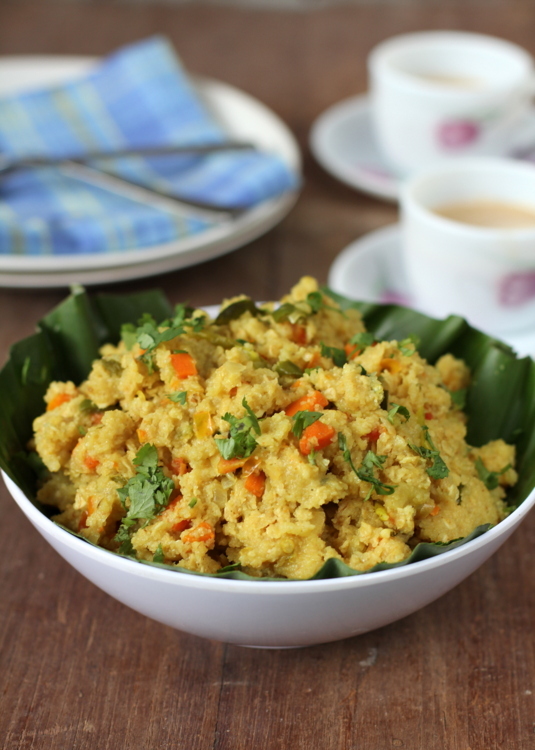 Oats Masala basically is nothing but inclusion of oats in Masala Upma recipe. I reduced the amount of semolina and included dry roasted instant oats, mixed vegetables and a generous amount of ghee. Oats and garam masala go well with each other and when they come together in the form of an upma it exudes warmth and spice. 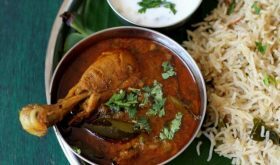 Be sure to serve Oats Masala warm and garnished with fresh coriander. I like to eat this oats recipe with home made tomato pickle. Heat a tbsp of ghee and oil in a heavy bottomed vessel. Add the cinnamon stick, cardamom and clove. 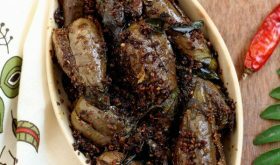 Allow them to sizzle and add the curry leaves, green chilies and sliced onions. Saute for 4 minutes. Add ginger garlic paste and saute for another 4 mts. Add chopped carrots, potatoes and capsicum and saute on medium flame for 5 mts. Reduce flame, place lid and cook for 7 minutes. Add chopped tomatoes and cook for 5 mts. Add salt and garam masala and mix. Add 3 cups of water and bring to a boil. Reduce flame and slowly add the roasted semolina while constantly mixing. Keep mixing on low to medium flame for 3 minutes. Add the oats at this stage and half a tbsp of ghee and mix. Cook on low flame for 3 minutes. Turn off heat. Add lemon juice and mix. Remove onto a serving bowl and garnish with fresh coriander leaves. Sprouts can also be added along with mixed vegetables. By Sailu Published: November 7, 2012 An easy Indian recipe with oats is Oats Masala. 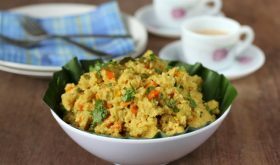 Try this healthy breakfast recipe prepared with oats, semolina, vegetables and flavored with garam masala. How many cup of water needs to be add? Thanks for sharing the receipe….can u plz update how many cups of water need to be added..
Hi Sailu, didn’t say how much water to be added. This is really a healthy diet. I have tried it and itâ€™s very delicious. My family members love it. 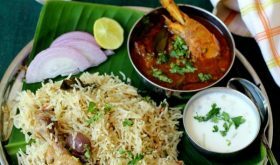 The ingredients ask for finely chopped tomato but it is not mentioned anywhere in the preparation method. When should I add tomato? Add tomatoes after the vegetables are cooked (before adding garam masala). Hi Sailu..First of all, Kudos on the great work! You inspire me to cook!! 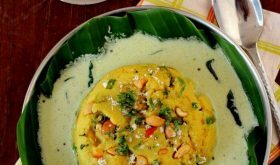 The Oats upma seems very good but is there a substitute i can use for semolina? You can try cornmeal that is finely ground. 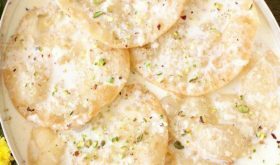 The ingredients ask for 11/2 tbsp of ghee. But the method ask only to add 1 and half tbsp of ghee . So where should i use the left ghee. In step 4, I have mentioned to add the left 1/2 tbsp ghee.